Since Samsung once again released their newest Galaxy S phone, the Galaxy S4, with one design across the globe, the accessory situation is going to be better than most Android fans are used to. With one design, more accessory makers can make products for the Galaxy S4, while in the past, they have had to pick and choose depending on the carrier. You’ll have more choices of cases and docks and flip covers than you can imagine over the coming months, should you buy the GS4. We’ll do our best to highlight some of our favorites, but since Samsung sent us one, we thought we’d start with their new S View Flip Cover. It’s identical in a lot of ways to the popular Flip Covers for the Galaxy S3 and Galaxy Note 2, but it has a window at the top of the cover that can provide you with basic information. Rather than having to flip open your cover to view the time or if you have notifications, a simple press on the lock switch will show you a special preview with clock, date, and notification bar. 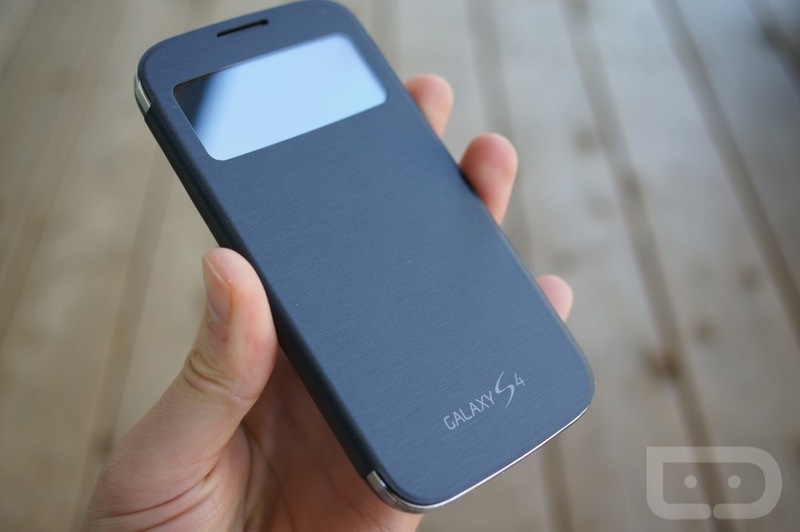 But beyond that, the S View Flip Cover sleeps and wakes the phone upon opening and shutting. The window also allows you to answer or decline calls without having to open the cover, something that wasn’t possible on the standard Flip Cover. To see it in action, hit up our video below. Then be sure to read our Galaxy S4 review, if you haven’t already.